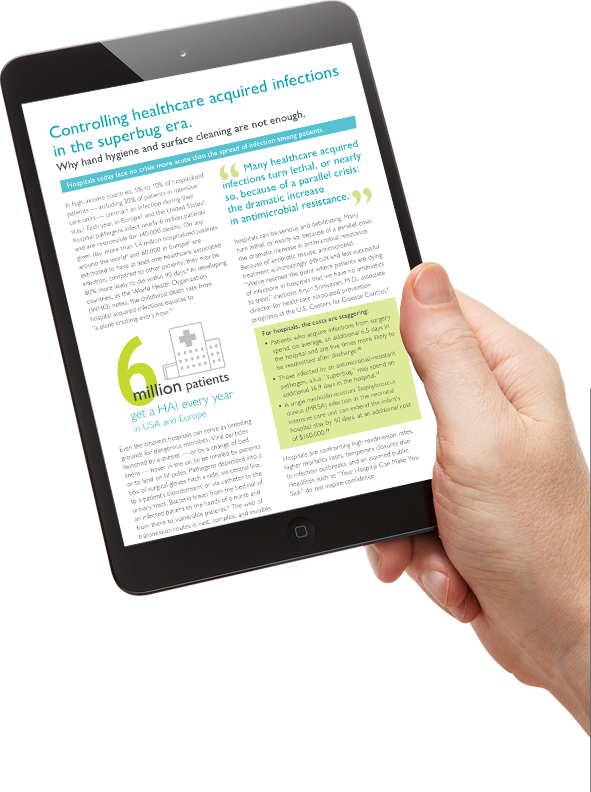 Download the White Paper: Controlling healthcare-acquired infections in the superbug era: Why hand hygiene and surface cleaning are not enough. Developed in collaboration with Dr. Ojan Assadian, president of the Austrian Society for Infection Control, our free White Paper explores the limitations of hand hygiene and surface cleaning in hospital settings and the importance of closing the loop with air disinfection. This 10-page White Paper draws upon 62 scientific sources to bring you one of the most comprehensive and engaging summaries on the subject. Healthcare-acquired infections are a global concern. In Europe alone, 4.5 million episodes of nosocomial infections occur every year*. Everyone who visits a healthcare facility, whether long-term or for acute care, is at risk. Hand hygiene and surface disinfection has long been the international gold standard for infection control in healthcare environments. But as our hospitals become more crowded, infections become harder to treat, and costs become unmanageable, traditional protocols need reinforcement. It's not enough: Your hospital is at risk. To learn more about the limitations of hand hygiene and surface cleaning protocols in hospitals, download the white paper for free. It's not enough: Your hospital could be at risk. Keep the risks in your hospital low. How compliant are your staff with hand hygiene protocols? Question 1: Staff always spend 40-60 seconds per hand wash and 15-20 seconds per hand rub. Question 2: Staff always perform hand hygiene exactly where they are delivering care to patients. Question 3: Staff always perform hand hygiene before touching a patient. Question 4: Staff always perform hand hygiene before any clean procedure. Question 5: Staff always perform hand hygiene after any risk of exposure to bodily fluid. Question 6: Staff always perform hand hygiene after touching a patient. Question 7: Staff always perform hand hygiene after touching patient surroundings. * Clack et al. (2017) “First-person view of pathogen transmission and hand hygiene – use of a new head-mounted video capture and coding tool.” Antimicrobial Resistance and Infection Control, vol. 6, no. 108, pp 1-9. * Attaway H.H. et al. (2012) "Intrinsic Bacterial Burden Associated with ICU Hospital Beds: Effects of Disinfection on Population Recovery and Mitigation of Potential Infection Risk". AJIC, vol 40, no. 10, pp. 907-12. Wherever people are coming and going, there are pathogens being introduced to indoor environments. When those pathogens become airborne, smaller particles can spread over long distances via air currents while larger particles settle on surfaces to be picked up by hands. One way to augment hand hygiene and surface cleaning is by cleaning the air. But common air cleaning solutions like ventilation, filtration, and sanitisation have their limits. Ventilation systems aren’t always able to reach dead zones like sinks and entry ways, HEPA filters can become ineffective due to irregular maintenance and even dangerous due to pathogen colonisation, and aggressive sanitisation methods like misting and UV are unsafe for use around people. Implementing air-disinfection technology that is constantly working safely around patients and staff at the point of care to reduce the amount of bioburden in the air leads to less surface contamination and a lower likelihood of direct and indirect transmission of infection. * Kowalski, W.J. (2007) “Air-Treatment Systems for Controlling Hospital Acquired Infections”. HPAC Engineering, vol.79, pp. 1-22. Trying to control infection today using systems of the past isn’t enough. As infections are becoming harder and more costly to treat, new solutions are needed. Learn more about the limits of hand hygiene and surface cleaning protocols in hospitals by downloading our white paper. The future of infection control is looking up. You should too. Our ultra-low energy plasma technology has been independently tested and is trusted by hundreds of healthcare facilities throughout the world.